“Marvel’s The Avengers” is a comic book lover’s ultimate fantasy: witnessing several favorite superheroes together, fighting evil and of course, all while saving mankind from destruction. Yes, it’s a superhero ‘all-star’ meet up, of sorts, starring Robert Downy Jr. as Iron Man, Mark Ruffalo as the Hulk, Chris Evans as Captain America, Chris Hemsworth as Thor, Scarlett Johansson as Black Widow and Jeremy Renner as Hawkeye. All, thankfully, sharing equal screen time in a first rate, comical, non-stop action packed film with a bit of ‘Transformers’ scattered throughout. The former film franchises of four heroes provided their introduction to cinema fans who may not have been familiar with the comic books, thus delivering an extra punch – familiarity with their personas. Many know the Hulk from the 1978 TV series and other major films starring Eric Bana and Edward Norton as Dr. Bruce Banner, aka the Hulk. I’m pleased to reveal that ‘Avengers’ take on the Hulk is my favorite so far; he’s the biggest Hulk yet, and overshadows all in size, scope and strength. Even though Black Widow and Hawkeye are less known, director and co/writer Joss Whedon (a self professed comic book fan) does a fine job of developing each. Whedon’s writing credits are impressive, “Toy Story,” “Buffy the Vampire Slayer” and “Cabin in the Woods,” to name a few. His direction here is pitch perfect, as each superhero’s personality is developed not only through actions but also smart dialogue, something generally lacking in action films. The glib comedic tone is consistent throughout, never appearing silly or contrived. We believe all that is happening – these super heroes are essentially part of the world’s landscape. Even though we know they aren’t real, in this film they emphatically are, as so much care and detail have gone into their credibility. A grandiose storyline is deep-seated in humanity that’s ‘super cool’ and ‘super fun’ for action fans and the archetypal comic book fan. 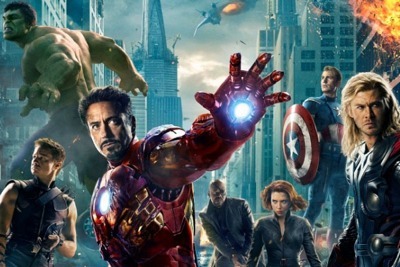 ‘Avengers’ covers both and, unquestionably, delivers. The balancing act of the characters and their distinctive personas is certainly a dubious feat here, requiring much perception and forethought to pull off. The premise centers on six super heroes who are fetched by S.H. I. E.L.D.’s director, Nick Fury, played convincingly by an eye-patched, Samuel L. Jackson. Fury gathers the heroes because Thor’s evil brother, the whiny god Loki (Tom Hiddleston), who suffers from a ‘dad liked you best’ complex, has compremised the powerful cosmic cube, the Tesseract. Loki’s digs are the interstellar world of Asgard, making his only access to earth through a space wormhole. Frankly, the reason for the ‘all-star superhero’ meet-up doesn’t really matter so much; the interactions between the heroes themselves are at the heart of this tale. Comically, when the superheroes are assembled, they check each other out through dialogue and exhibiting their physical attributes. The match-up creates very silly scenes of who can out-do the other. The banter and eye-popping special effects are what makes this film tick. All I can say is, “Hold on to your popcorn as you’re in for a rip-roaring, roller coaster of a ride in this spectacle that’s perfect for ages ten and above.” The film’s rating of PG-13 is due to the violence and somewhat frightening situations, which parents can ascertain for their own youngsters. Bottom-line: This star-studded, action packed film lives up to all the hype. Cast: Captain America (Chris Evans), Thor (Chris Hemsworth), Iron Man (Robert Downey Jr.), The Hulk (Mark Ruffalo), Black Widow (Scarlett Johansson), Hawkeye (Jeremy Renner), Nick Fury (Samuel L. Jackson) and Gwyneth Paltrow (Pepper Potts). Studio: Marvel Comics, Paramount Studios and Disney.